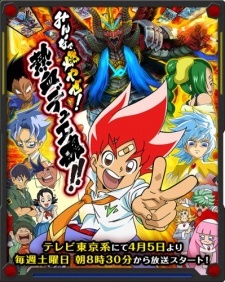 the 10th season of the Duel Masters Anime, continuing the story of the Duel Masters Victory V3 series. In the Holy Land, Yatsuo card battle, the Duel Masters! De~yuema! De~yuema ANTICIPATED bald properly thick all-time high, De~yuema ban has been enforced due to fierce battle that took place once. However, Katsuta trump card that through the time of two years, De~yuema lifting of the ban has been called the strongest duelist once decision! Finally. Katsuta became a junior high school sophomore lost his passion for De~yuema, every day of crazy about curry bread favorite food. However, by the chance to encounter a duelist and mystery baseball Ace Hokaben, Katsuta is pursuing his way of De~yuema and ANTICIPATED bald correctly Atsu again through reunion with childhood friend, Takigawa Lulu, the De~yuema game of the Duelist of mystery ! De~yuema arrival of a new era! De~yue soul Tagiru burning against the rival A new powerhouse and the unknown, A furious fight begins now! Watch Duel Masters Versus Episodes Online at Animegg.org. Duel Masters Versus is available in High Definition only through Animegg.org. Choose an episode below and start watching Duel Masters Versus in Subbed & Dubbed HD now.